Planted zinnia seeds and covered area w/black weed barrier cloth to keep out my cats and area birds from eating seeds. I've seen this at vegetable farms to promote early growth. 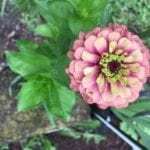 Is this ok for zinnia seeds? How long is the seed germination period? That is, when can I take the cloth off to let the sun in?